It’s a vague title for a little round-up piece I’m writing here during lunch. Things have been busy as my girl wrapped up preschool and started kindergarten, not to mention the beginning of our typically busy birthday party season and a few big projects at work. So, when I noticed this had all conspired to keep me from posting for a while, I thought I’d share some quick thoughts on a few new cool things I’ve seen and tried recently. The first thing I thought when I heard about these was “why didn’t I think of that? !” SafetyTats are customizable temporary tattoos for your kids that have your phone number printed on them. Here in Austin there are always lots of festivals that we like to attend, and we knew a trip to SeaWorld or Six Flags would soon be in our future (put it off as long as I could, but it was time). Our daughter always likes to wear temporary tattoos, so what’s not to love about a fun way to make sure someone can always contact you if she gets lost in a crowd?! Part of the design rubbed off when she was getting dressed (see below), but I think that was because it wasn’t fully dry yet and the number remained easily readable throughout a three-day weekend in San Antonio. We give it a thumbs up! One of the most aggravating parts of my weekday is always bath/bedtime. I get so frustrated nagging at my girl to get into the bath and get ready for bed! So when someone mentioned the Handipoints.com site in the comments of my last ThisMommyGig.com post, it sounded like something I should explore. Part virtual world, part chore list, the novelty of it seems to be just right for grabbing my girl’s attention. This free site lets you set up task/chore lists through which kids can earn points by completing. You set up a goal (in our case it was a new Webkinz) and determine how many points they have to earn to reach that goal. Kids self-report on how they are doing, and parents come behind to proof and grade how well they completed the tasks. You can chose from a list of common tasks or create custom ones. Some of the pre-programmed ones were a little too generic for me, so first on our list was a custom task to not just take a bath, but to “take a bath the first time told to do it.” In addition to the “handipoints” they earn toward the big goal you set, they can more easily earn bonus points that are good for purchasing items for their virtual cat (that very Webkinz-like aspect of the site). We’re still in the early stages of trying this one out, but the initial reaction is a definite thumbs up. Ok, I just heard about this one today, so it’s not been tried, but I just had to say something about it because it’s so funny. 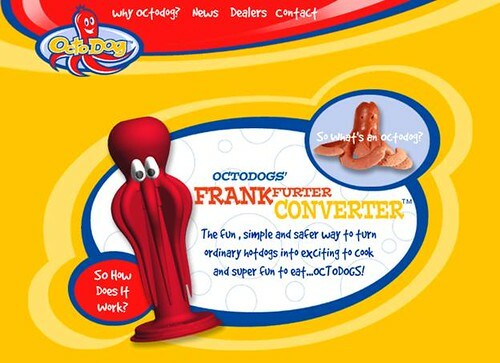 This Frankfurter Converter(TM) cuts your typical hotdog so that it has eight octopus legs! I can’t decide if what tickles my funny bone the most is the idea itself, the way it looks, or the marketing angle of making it safer to eat hot dogs! While I may be laughing, I must admit I’m also considering ordering one for the sheer fun of it. Judging by the media coverage it’s already garnered, I may be one of the last to hear about it, though; so, if you’ve tried it already, please do let me know how it worked! Thanks to @byjove, today I discovered some nifty things you can do with Twitter’s search function that they bought from Summize. I’d never actually hit the “advanced search” button before, but there are some interesting options presented when you do. 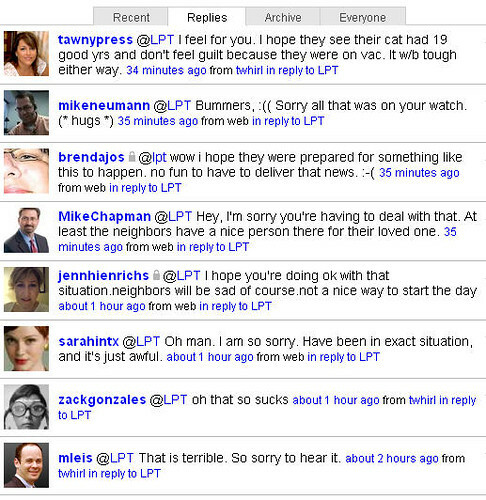 Some of the queries you can make include looking specifically for tweets with links, looking for tweets sent from within a certain geographic area and tweets limited to a certain language – which will come in handy for sifting out all the Italian tweets that aren’t talking about Dell Inc. when they include the word dell. But the most interesting thing that jumped out at me was the ability to search tweets by “attitudes.” You can check if you would like to query tweets with a positive attitude, a negative attitude or asking a question. For example, my friend @RichardatDell seems to be a much happier person than I do based on the frequency of tweets with “positive attitude” that show up in each of our search results. While @DaveWiner, who’s tweets had given me an impression of being somewhat negative (don’t know him personally, so shouldn’t judge, but did), actually doesn’t appear to be so negative that often! And, @omarg is a reporter, so you’d expect him to ask a lot of questions, right? So is this search really telling us the tone of tweets? Could it be monitoring public sentiment that well? Certainly not. And the clue to how it works is there with the emoticons – smiley and frowny faces next to the positive and negative attitude check boxes. Obviously, the search is only looking for and returning tweets with those in them. And a question simply looks for question marks in tweets. So, I’m dubbing this emotisearch – not sure if it’s really useful, but it certainly is fun! I thought I wasn’t really going to watch the Olympics this year. Not as a protest like some are doing, but just because everything leading up to them had seemed to be so controversial. 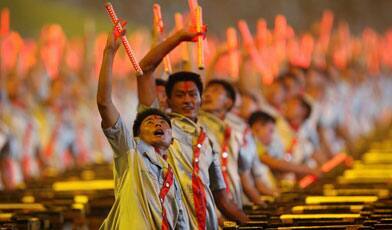 Controversy over the Chinese government, human rights violations, blocking of Internet access and unhealthy pollution had seemed to overshadow the event itself. Throw in some doping athletes and I just lost the feeling of pride and desire for our teams to win that is necessary for me to really get into any athletic event. I guess politics is nothing new for the Olympics, but it just left a bad taste in my mouth which didn’t inspire me to watch. I figured that was it then. I’d seen the fireworks and that would be all the Olympic watching I’d really do. Then, coverage of the actual competition began. And, a lot of it was women, which really seemed to grab my girl’s attention. This weekend we’ve watched women fence, swim, play volleyball and cycle, and it feels good to join my girl in chants of “U-S-A, U-S-A” as we watch these female athletes give it their all. We’re watching the guys, too – mostly swimming. Relay seems to interest my own little fish the most. Maybe watching these events will inspire her to attempt feats of her own one day. So now, whenever I can wrest the remote control away from my golf-watching husband and change the channel, I’m watching the Olympics with my daughter. She has no idea about all the politics shrouding the events. She simply sees the fun of pulling for the home team and watching talented, hard-working athletes give it their all and reveling in the outcome. And, that’s what the Olympics really are about. That’s the opening line from my latest post over on ThisMommyGig.com. It’s a tale of how I resisted pushing kid-focused virtual worlds on others; but, eventually gave in and started one of my friend’s kids down the path of too many hours spent on a computer and too many whines for one more Webkinz pet. Our next-door-neighbors recently left for a two-week vacation and asked us to take care of their 19-year-old cat Spike. Nineteen years for a cat is apparently somewhere between 78-86 years in human terms, and Spike was definitely beginning to show his age. They said he would just need some fresh food and please scoop his litter box every couple of days. I started to worry about him the first time I went over to check on him. There was nothing to scoop and the food looked untouched. My hubby said sometimes pets get a little depressed when their owners go away and not to worry that he’d eat when he got hungry enough. Well, I went back last night and knew in my heart this wasn’t just depression. I called them to let them know I was worried and suggest a trip to the vet. We decided to wait and decide this morning. Well, my suspicion was correct and when I returned to their house in the morning, Spike had passed away. As I go into dealing-with-a-minor-crisis mode, I stop for a moment to tweet about what was happening. Some people probably think that it’s weird to twitter at times like that, but posting updates about what I’m doing on the microblogging platform has just become ingrained into my life. I guess I share The Zen Hippie‘s hope that someone, somewhere finds something I say interesting. No Dave, Twitter is not strictly populated by “those who don’t spend enough time with others.” And, while Patton Oswalt may say Twitter proves that bloggers are the root of all evil, I’m here to say it’s populated by genuinely good people. I’m grateful that it has brought many of them my way. I’m also very flattered to have recently been named one of “10 Austinites with consistent, interesting posts whom you might want to follow when you begin on Twitter.” It’s amazing company in which to be. Still not on Twitter or want to encourage someone else to join? Mashable’s “Seven Ways to Get Your Mom on Twitter” has some good info, including a helpful list of Twitter lingo. Is it just me, or is anyone else out there getting tired of all the broadcast and radio commercials where cable companies tell us how horrible satellite service is and satellite companies tell us how horrible cable service can be? Way back in 2003, the New York Times said it was getting bad and in my opinion it’s only gotten worse now that they can offer phone service, too. Often it seems like each is saying the same thing about the other – they’re more expensive, they don’t offer as many channels, they’re not as reliable, they’re service stinks. Apparently this is not just a U.S. thing, either. A lot of the ones I see and hear seem to be low-budget locally produced pieces, but now DirectTV is bringing in big names (and tiny bikinis). Enough already! It seems like no matter which we choose, we’re made to feel like an idiot for picking the one we did. Get a handful of people together to discuss the topic and they’ll be as polarized as if you were talking about the presidential election. I did find one nice side-by-side comparison online that might be helpful to folks debating a change. Me, I just keep avoiding dealing with it every time my hubby brings it up; and, come here to vent my frustration. I mean, can’t they distinguish themselves from each other without spending so much airspace putting the competition down?